right hand corner of the webpage to have access to the REGISTER NOW button. After registering, check the REGISTRANTS list to make sure your name appears. This is a chance to mingle with a small group of GNPS members at the home of a member. Make new friends in a casual at-home setting. Coffee, tea and nibbles will be served. Cozy up and lets get to know each other. 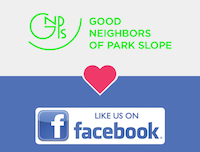 If you are new to Good Neighbors of Park Slope, this is a great way to talk to other members to see what we are about. Several members of our Board of Directors will be here to answer your questions. If this is event is full and you would like to come, please email the contact person to be put on the waitlist. Exact address will be included in confirmation email. A cat lives in this home. Please contact us for additional accessibility information.